IBI Consultants is an independent, U.S.-based company that provides national security consulting services to governments and private foundations world-wide. Headed by Douglas Farah, who is recognized internationally as an expert in national security, intelligence reform and illicit weapons transfer, IBI Consultants provides research, analysis and scenario development services through a vast network of on-the-ground experts. Mr. Farah appears regularly in national and international media. 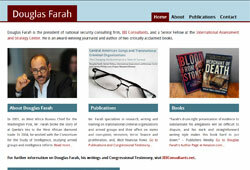 Former West Africa bureau chief for The Washington Post, Douglas Farah, is a national security consultant/analyst, an internationally recognized expert on illicit weapons transfer and author of two critically acclaimed books. When his blog was hacked, he hired us to create a new, secure, custom content managment system. In addition to security-hardened code, we protect his websites from hackers via our state-of-the-art Intrusion Prevention System. 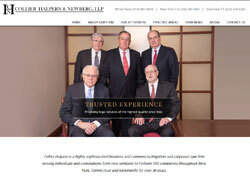 Winter Tree Media was hired to redesign the website of Westchester County litigation law firm, Collier Halpern & Newberg. As a result of our search engine optimization services, they now rank in top positions for a number of their targeted keywords. 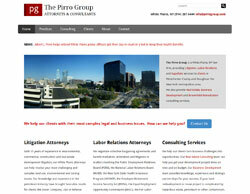 White Plains attorney, consultant and lobbyist Albert J. Pirro, Jr. hired us to redesign his website. We created a clean, user friendly interface and preformed a basic Search Engine Optimization of the new site. Mr. Pirro has been a key figure in the Westchester County business community for nearly four decades, providing legal, consulting and lobbying services to a broad range of businesses and individuals. 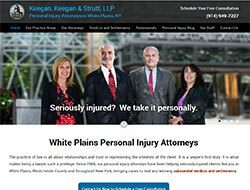 White Plains personal injury firm, Keegan, Keegan & Strutt, LLP hired us to redesign their website. As a result of our SEO and social media management services, KKS's web presence improved to page one in Google for a number of their practice areas. Perhaps best known for his long-standing collaboration with singer Annie Haslam and her progressive rock group, Rennaisance, keyboardist, composer and producer Rave Tesar hired Winter Tree Media to design a web site reflective of his high standing in the international arts community. The site features Winter Tree Media's custom Flash animation and original artwork. 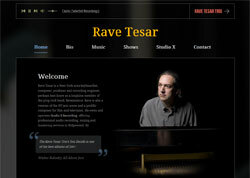 The site employs custom software that allows visitors to listen to Rave's music while protecting his intellectual property from unauthorized downloads. We also provide comprehensive IT support services for his recording studio. 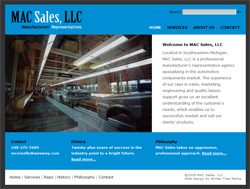 MAC Sales, LLC is a professional manufacturer's representative agency specializing in the automotive components market in Southern Michigan. 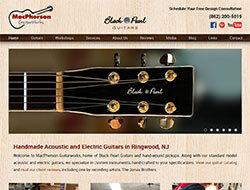 Like so many of our clients, MacPherson Guitarworks had virtually no web presence when they first approached us for a new website design. They had a website, but new customers were not finding them. Now, as a result of our web design and SEO services, they rank #1 among builders of custom guitars in Delaware (updated on February 7, 2019).